The atmospheric baritone. Next to Nick Cave and Tom Waits, Mark Lanegan possesses one of the few contemporary voices capable of a kind of subliminal storytelling that exists outside the realm of pure vocabulary. It’s a vocal delivery that carries with it a certain gravitas, one that informs each vowel and every consonant. A voice that chews its words and makes a meal out of a every sentence – a voice that still exists in the worlds of soul and r&b, but one that has become conspicuously absent in the realm of ‘rock’ music. 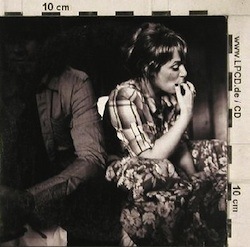 In terms of its employment, Lanegan has loaned his vocals out to many a side project over the years, yet none have felt more organic than that of his collaboration with Scottish chanteuse Isobel Campbell. A modern day take on the work Lee Hazlewood was doing with Nancy Sinatra in the late sixties, the pair first coupled in 2004 on the ep Time Is Just The Same. But it’s their second output and first LP, Ballad Of The Broken Seas, that I’ve been revisiting of late – in particular the album’s kickoff, “Deus Ibi Est” – latin for God Is Present. Solo or otherwise this may very well be my favorite Lanegan vocal. The way he plays it, the song comes across as both foreboding and omniscient, the vibe more Rime of the Ancient Mariner than “Some Velvet Morning.” And when it nears too close to the precipice, Campbell’s accompaniment pulls Lanegan, and in turn the listener, back in. Lanegan’s latest LP, Blues Funeral – his 7th and first album since 2004’s Bubblegum, was released last month via 4AD. It’s his first release following Hawk, his most recent album with Isobel Campbell.